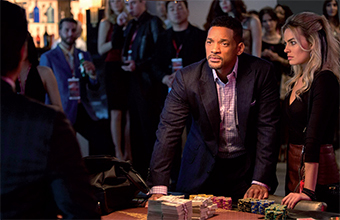 THE ebullient Will Smith has been a little quiet of late, both in terms of output and quality. Thankfully, Focus puts that right by challenging your grey matter and spinning a thrilling yarn from beginning to end. Perpetually-youthful Smith (trust me, look at pictures of him from the Fresh Prince of Bel Air days in 1990 and now, and you’ll just laugh at the total absence of ageing) is in fine form as seasoned conman Nicky Spurgeon, who has charisma and smoothness in buckets. Unwinding at a local nightclub one evening, youthful and obviously inexperienced fraudster Jess (Robbie) attempts to seduce him in order to extricate money. When they bump into each other at another nightclub a few days later (how coincidental! ), Jess convinces Nicky to become her mentor. Together, they start performing cons around the country, but things become especially complicated when their relationship drifts away from professionalism towards a romantic one. Apparently, avoiding emotional attachment with anyone in the con business is rule 101 of the profession, and breaking this rule leads to a tumultuous series of events which unfold as the film progresses. ‘Never lose focus’ is the pervading theme, both in the narrative and towards the audience. Focus is extremely dialogue-heavy and features more twists and turns than the heart of Adliya, so you have to be paying attention otherwise clues will go right over your head. Luckily, the pay-off is worth the investment and you will leave feeling satisfaction at how the story comes full circle. In an era where most big budget movies (particularly when heists are involved) throw fast cars and explosions at you while vomiting modern disco garbage out of the speakers, it’s a genuine pleasure to see a movie given plenty of room to breathe and rooted in a foundation of clever wordplay. Of course, with such a heavy reliance on the script and interplay between the two leads, the film would fall down if there was a complete dearth of chemistry. Thankfully, Smith and Robbie get on like a house on fire and their relationship is as believable as it is combustible. This is helped by fantastic direction from both Glenn Ficarra and John Requa, who know just how long to play a scene out and throw a few editing quirks in to keep the viewers on their toes. Scene composition is outstanding, and really elevates the film above its competitors. Just with camera work alone, a story can be told in five minutes here whereas if another was in charge, it would take another twenty to achieve. If there’s one area where the film loses focus, it’s on what genre it is trying to be. One moment it’s an out-and-out thriller, the next it’s a romantic comedy, and then it’s a black comedy. It should have remained the former throughout, as the attempts at humour and slapstick just don’t really work within the context of the film. If a more humorous tone had been set since the start it might have been better, but to portray itself as serious and then pepper the film with sillier bits just comes across as incongruous. This is only a minor quibble, as for the most part this is a throwback to a better time, when plots weren’t overcomplicated or nonsensical and driven by dialogue rather than special effects and stunts. Plans seem to come together a little too perfectly with a couple of outrageous coincidences, and the comedy is jarring, but aside from that, this is an excellently-directed and choreographed film. Definitely worth a watch!